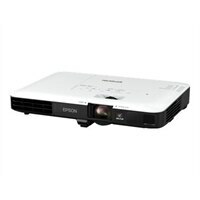 Epson PowerLite 1780W Office Projector - Portable HD ProjectorAchieve brilliant presentations wherever business takes you with the ultra slim PowerLite 1780W wireless widescreen projector. This thin 4 lb model delivers 3,000 lumens of color brightness and 3,000 lumens of white brightness plus WXGA resolution - ideal for HD-quality content. Featuring the latest in connectivity, this projector makes it easy to wirelessly share content from your tablet or smartphone. Or, share HD videos using your streaming device. The 1780W supports Chromecast, Roku and MHL-enabled devices. And, it offers fast wireless setup with its on-screen QR code. Achieve brilliant presentations wherever business takes you with the ultra slim PowerLite 1780W wireless widescreen projector. This thin 4 lb model delivers 3,000 lumens of color brightness and 3,000 lumens of white brightness plus WXGA resolution - ideal for HD-quality content. Featuring the latest in connectivity, this projector makes it easy to wirelessly share content from your tablet or smartphone. Or, share HD videos using your streaming device. The 1780W supports Chromecast, Roku and MHL-enabled devices. And, it offers fast wireless setup with its on-screen QR code.